Kocula is an island off the Croatian coast. It was beautiful; it was quiet. After basking in the main center for a day, I was ready for something new but I had a full day left there. What to do? I rented a bicycle in the main square. I got one with a basket for my knapsack, such a good idea. From the main square, I set off for grape vineyards and olive groves. The shops disappeared. The houses got further apart. I was having a time admiring the butterflies and the wildflowers. 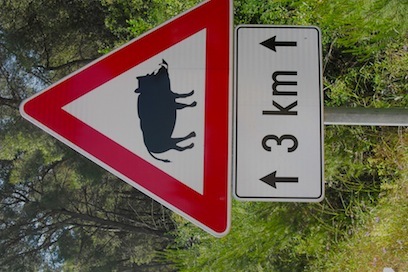 But it was a bit jolting when I started coming upon roadsigns warning drivers to watch out for wild boar. I hear they run fast and my bicycling is on the slow side. I never did decide what song to sing in case of an encounter. Fortunately, they must have been roaming elsewhere on that day. I rode onto to piers with places to stop for refreshment along the coast. I stopped for a swim at a beach along the way. All in all, it was tranquil fun. 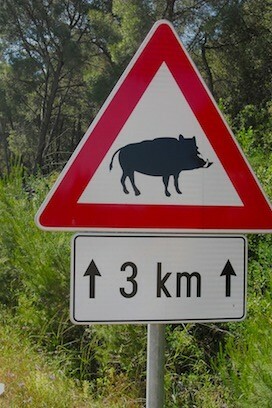 I wonder now if they put those wild boar warnings out just to tease the tourists.